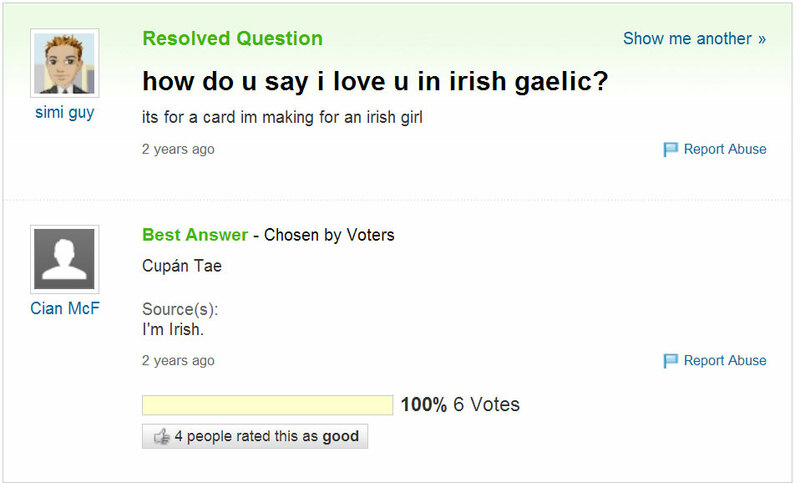 Gaeilge is the First Official language of the Republic of Ireland. While English is in practice the first language of most Irish people, those in Gaeltacht areas speak Gaeilge as their first language, and almost all Irish people have it as a second language. The main dialect of Irish taught in schools, used in media and for official purposes is the Caighdeán Oifigiúil or 'Standard Irish', a standardised form of the language largely based on the Connacht dialect (due to the Connacht Gaeltacht having the largest number of native speakers). Most of the resources here use the Standardised form, though there are also resources for learning the dialects. There are Gaeltachta (Irish-speaking areas) in all 4 provinces of Ireland. The Gaeltacht Bill that passed in 2012 could mean that areas such as Ennis and Clondalkin could gain the status of Líonra Gaeilge (areas with strong Irish-speaking communities) over the next few years. Also, bear in mind that while the Irish name for the language is Gaeilge, in English we refer to it as 'Irish', not 'Gaelic'. Gaelic is a group of languages (comprising of Irish, Scottish Gaelic and Manx, it is the same as the definition of Goidelic), and if you refer to Irish as 'Gaelic', you'll sound like an American tourist. There is a Permanent North American Gaeltacht in Canada (their offical website is here), so Amerimutts and Canadians can go up there and learn Irish if they want (it's probably a lot cheaper than coming to Ireland for practise). Apparently, there was also a Newfoundland dialect of Irish up until pretty recently. Gaeilge San Astráil has tons of info on Irish in Australia, and includes a fortnightly magazine called An Luibín, which is available for download. ​Conradh na Gaeilge has a branch in New England, and a number of universities seem to have courses in the language. 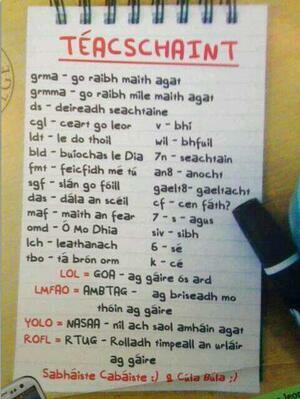 Daltaí na Gaeilge is a good source of info for American learners. Coláiste na nGael has a lot of links to learning resources, classes etc. in Britain. Teach Yourself Irish (Myles Dillon & Donnacha Ó Cróinín, 1961) I've heard this book highly recommended for those who want to learn Munster Irish (specifically Cork Irish). The spellings are a little different to the modern Caighdeán, but not as different as before the spelling reforms. Irish For All A new site for adult learners where you can choose you level, add friends, join groups etc. Bitesize Irish Gaelic A site with a whole load of small irish lessons, looks pretty handy! Scríobh A site with loads of little bits of grammar, vocab etc. Most universities in Ireland have Irish-language societies, e.g. Trinity, UCC, UCD, NUIG, Queens, etc. There's probably loads more (some universities have 2 or more), so have a look yourself. Club Conradh na Gaeilge This is a pub underneath Conradh na Gaeilge on Harcourt St. in Dublin. Cheap pints, so worth a visit for that anyway. ReRá These guys hold a conversational group in the Franciscan Well in Cork every so often. Seems to be primarily a chat while having a few drinks, but they do competitions and stuff too. I'll update this when I know more about them. Na Gaeil Óga CLG An Irish-speaking GAA club founded in Dublin a few years ago. Raidió na Gaeltachta (aka RnaG) This is the main Irish-language radio station. Lots of traditional music and conversation. It's often a bit dull, but it's the best-quality Irish you'll hear anywhere, with plenty of native speakers, and a variety of dialects. 93-95 FM (I think), also online, and can be listened to on Sky channel 0166. Raidió Na Life (Liffey Radio) A long-running station based in Dublin. It's a bit more accessible than RnaG (albeit with non-Gaeltacht speakers), and plays some good music. Tends to have a lot more Urban Irish than RnaG. You can listen to it online, and they also have podcasts. 106.4 FM and online. Raidió Fáilte This is a station based in Belfast. It's pretty good, they play some great tunes. Being in the North, they speak in the Ulster dialect (or, at least, standard Irish with an Ulster flavour), which is a little different from Munster and Connacht dialects; it's great for getting used to hearing that accent. 107.1 FM and online. Raidió Rí-Rá A radio station aimed at younger people. They tend to play a lot of top-40 music, so there's less conversation, but worth a listen anyway. They don't broadcast on FM anymore, but you can listen online. TG4 (Pronounced "tee-gee-ceathair") This is Ireland's Irish-language TV station. They're producing some good stuff lately (especially good travel programs, for some reason), so its well worth a watch. They usually put English subtitles on their shows as well. BBC have a surprising number of Irish programs, so it's worth keeping an eye out for them. Tuarisc This is a new site for news, current affairs etc., looks promising! Peig New site with news, current affairs, entertainment, etc. Also has links to all the radio Gaeilge stations. Nuacht RTÉ RTÉ news site in Irish. Nós Online and print-edition magazine about music, movies, technology etc. The monthly print edition is on sale in Easons for €4 (and also in Reads on Nassau St. in Dublin), and subscriptions are available too. It's really good, probably the best Irish magazine around the place atm! BBC Irish The BBC website for Irish, with loads of content. Further proof that Gaeilge seems to be doing fairly well up in the North! The Best is Yet To Come The main theme to Metal Gear Solid is in Irish! Avicii Vs. Lurgan: Wake Me Up One of a number of videos done by students in an Irish summer college, its surprisingly good! Amhrán na gCupán Another video from Lurgan, and really well done. Taibhse by Luan Parle. This is one of many songs that were rerecorded in Irish over the past few years (there's tons of them on youtube). This is one of the better ones imo, but have a look at the others too. Ba Mhaith Lion Bruíon Le D'Athair Irish version of the Rubberbandits 'I wanna fight your father'. Dats limerick citaaay. Yu Ming Is Ainm Dom Short movie about a Chinese guy who learns Irish. It's pretty well-known. Filleann an Feall A famous short movie. It also features Cillian Murphy (Scarecrow in Batman Begins and Fischer in Inception), before he got really famous. Gaelgory, AKA T-Rex Ó Saurus. He's a teacher from somewhere up the counry that has gone mental and decided to make videos in Irish featuring a plastic T-Rex. Abair This is an interesting one- it's a text-to-speech project from TCD where you type in words or phrases, and it plays them back to you in a dialect of your choice. Currently they have the Gaoth Dobhair and Connemara dialects, and they say they're going to include a Munster dialect soon. Site with Irish versions of software Includes Bittorrent, Utorrent, Firefox, and a few others. If the software has a Gaeilge setting, it highlights it. Minecraft Apparently, someone is doing an Irish translation of Minecraft. He's not far off finished, by the look of it, so keep an eye on it! ​Flann O'Brien/ Myles na gCopaleen/ Brian O'Nolan Very famous writer in both English and Irish. His works tend to be either satirical or surreal, and usually pretty funny. He spoke Irish fluently, and wrote An Béal Bocht as a parody of the genre of novels typified by 'Peig' (Peig Sayers) and 'An tOileánach' (Tomás Ó Criothain). It's not too difficult, but if you read it side-by-side with the English version you'll get more of the jokes. Peadar Ua Laoighaire A celebrated writer from Cork who wrote around the beginning of the 20th Century. He argued, before an Caighdeán Oifigiúil was introduced, that Munster Irish should become the standard, and wrote books like Séadna as examples of what he considered to be good Irish. Mairtín Ó Cadháin One of the most famous writers in Irish of the 20th Century. He wrote in a modernist style, and was a professor of Irish at Trinity at one point. Alan Titley One of the more well-known writers out there atm. He's written a good number of books and plays, and writes regularly in the Billeog section of the Irish Times. He's also a bit of a legend irl. Seán Ó Ríordáin Probably the greatest poet in Irish of the 20th Century. He was from Baile Bhúirne (in the Muskerry Gaeltacht) in Cork. He was responsible for bringing modern European elements to Irish poetry, and really evolved it. No list of Gaeilge authors is complete without him. Eireaball Spideoge and Tar Éis Mo Bháis are probably his most famous works. Maidhc Dainín Ó Sé The late father of Daithí Ó Sé, Maidhc Dainín was a well-loved figure from the Kerry gaeltacht, and is considered to be one of the best ever proponents of the Irish language. He wrote fairly extensively, so his books are worth a look. GaelChultúr These guys do classes in various places around the country, including Dublin. Apparently they do classes for every level, and have been awarded third-level status. Úsádim Facebook as Gaeilge A facebook group for people who use the Irish language setting on Facebook. The guy who runs it puts up loads of pictures, seanfhocail, etc., so its a handy one to Like! Doegen Records Web Project Really interesting site- it's a digital archive of a ton of recordings made at the start of the 20th century of various dialects, including now-extinct ones such as Armagh, Tipperary and Tyrone Irish. Click on your county on the map, and it'll show you all the recordings it has; you can stream the recordings (and download the mp3s if you like), and there's both transcriptions of the recordings and translations of them on each page. What better way to get (back) into learning the language than by learning then native dialect of your area? RTÉ Ríleanna agus Téipeanna More dialect recordings- this series has a number of recordings from around the country, including the Clare Gaeltacht, which wasn't recognised for political reasons, and which people are now currently trying to revive. Download them before RTÉ randomly take down the page! Cork Irish Blog by some English guy who decided to learn the Cork dialect of Munster Irish instead of the Caighdeán Oifigiúil. He's apparently not updating it anymore, but it's a goldmine for Munster Irish vocab, grammar, recordings etc.